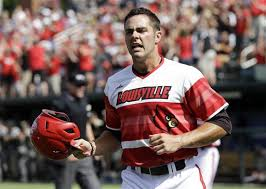 CLEARWATER, Fla. – Louisville senior outfielder Jeff Gardner was named American Athletic Conference Player of the Year and led a group of seven Cardinals earning All-American Conference honors at Tuesday night’s opening ceremonies of the 2014 American Conference Championship at Bright House Field. A unanimous First Team All-American Conference selection, Gardner (Louisville, Ky.) hit .340 with eight home runs and 19 doubles while leading the league with 61 RBI and a .575 slugging percentage. With 54 starts this season for the top-seeded and fifth-ranked Cardinals, Gardner was chosen as an all-conference honoree for the third straight season (2013 All-Big East First Team, 2012 All-Big East Second Team) and will enter this week’s American Conference Championship with a .327 career average, 22 collegiate home runs and151 career RBI in 168 starts and 207 games played. This year’s honor for Gardner marks the eighth time in the last eight seasons a member of the Cardinals has been selected as conference player or pitcher of the year. Gardner is the first player of the year for the honoree for Louisville since Chris Dominguez earned back-to-back Big East Player of the Year awards in 2008 and 2009. Joining Gardner as All-American Conference First Team selections were junior closer Nick Burdi, senior third baseman Alex Chittenden and sophomore righthanded pitcher Kyle Funkhouser. Junior righty Jared Ruxer and senior outfielder/lefty pitcher Cole Sturgeon were All-American Conference Second Team honorees, while junior second baseman Zach Lucas was an All-American Conference Third Team pick. Burdi (Downers Grove, Ill.) leads the conference and ranks in the top 10 nationally with 14 saves this season to go with a 3-1 record and a 0.58 ERA in 25 relief appearances. He has 54 strikeouts and just eight walks while opposing batters are hitting only .133 against him in 31.0 innings pitched. As the Cardinals’ everyday third baseman, Chittenden (Indianapolis, Ind.) hit .308 with one home run and 22 RBI while starting 53 games this season. As one of five Louisville seniors, Chittenden has played in 211 games for the Cardinals with 142 starts. A unanimous First Team selection, Funkhouser (Oak Forest, Ill.) was dominant on the mound for the Cardinals going 11-2 with a 1.74 ERA in 14 weekend starts this season. In 93.0 innings pitched, he had 92 strikeouts, while opposing batters are hit just .202 against him. In eight American Conference starts this season, he finished 7-1 with a 0.99 ERA and 58 strikeouts in 54.2 innings. Entering the postseason, Funkhouser (Oak Forest, Ill.) has not allowed an earned run in his last 40.0 innings pitched dating back to the first inning of his win at Houston on April 11. Ruxer (Indianapolis, Ind.) closed the regular season with a 7-1 record and a 2.27 ERA in 13 starts, while in 75.1 innings on the mound, he has 68 strikeouts and just 16 walks. The most experienced pitcher on the Louisville staff, Ruxer has 34 career starts and 191.0 innings at the collegiate level. A three-time all-conference selection, Sturgeon (Owensboro, Ky.) was arguably the Cardinals’ most valuable player starting all 56 games in the outfield while also making 22 relief appearances on the mound. At the plate, Sturgeon hit .319 a league-leading 49 runs scored, 15 doubles and 17 stolen bases, while on the mound, he was 3-0 with one save, a 1.67 ERA and 31 strikeouts in 32.1 innings pitched. Lucas (Louisville, Ky.) made 54 starts and appeared in all 56 games hitting .259 with four home runs and 41 RBI. The No. 5 Cardinals will begin Pool A action at the American Conference Championship on Thursday at 3 p.m., ET against No. 8 seed Memphis. Louisville will continue its slate on Friday at 3 p.m., against No. 5 seed USF before concluding the preliminary action on Saturday at 3 p.m., against No. 4 seed Rutgers. The winners of Pool A and Pool B will advance to Sunday’s final, set for noon on ESPNU. Fans can follow Louisville baseball on Twitter (@UofLBaseball) at http://twitter.com/uoflbaseball and on Facebook at http://www.facebook.com/ulbaseball. P Eric Skoglund * UCF Jr. Sarasota, Fla.
P Kyle Funkhouser * Louisville So. Oak Forest, Ill.
P Caleb Wallingford Memphis Jr. Elkhorn, Neb. P Jimmy Herget USF So. Tampa, Fla.
RP Nick Burdi Louisville Jr. Downers Grove, Ill.
C Max McDowell UConn So. North Huntingdon, Pa.
1B Bobby Melley UConn So. Barnstable, Mass. 2B Nick Favatella Rutgers Sr. Washington Township, N.J.
SS Tommy Williams UCF Jr. North Palm Beach, Fla.
3B Alex Chittenden Louisville Sr. Indianapolis, Ind. OF Ian Happ Cincinnati So. Pittsburgh, Pa.
OF Blake Davey UConn Jr. Newport Beach, Calif.
OF Jeff Gardner * Louisville Sr. Louisville, Ky.
P Zach Rodgers UCF Jr. Glendale, Ariz.
P Jared Ruxer Louisville Jr. Indianapolis, Ind. C Levi Borders USF So. Winter Haven, Fla.
1B James Vasquez UCF Jr. Palm City, Fla.
2B Dylan Moore UCF Jr. Yorba Linda, Calif.
SS Kyle Teaf USF Jr. Tallahassee, Fla.
3B Derek Peterson Temple Sr. Wall, N.J.
OF Derrick Salberg UCF Jr. Kelso, Wash.
OF Cole Sturgeon Louisville Sr. Owensboro, Ky.
P Anthony Marzi UConn Sr. Berlin, Conn.
P Jon Reed Memphis Sr. Tulsa, Okla.
P Howie Brey Rutgers So. Middletown, N.J.
1B Brian O’Grady Rutgers Sr. Warminster, Pa.
2B Zach Lucas Louisville Jr. Louisville, Ky.
SS Pat Sweeney Rutgers Sr. Sparta, N.J.
OF Erik Barber UCF Jr. Lakeland, Fla.
OF Justin Glass Cincinnati Sr. Fort Wayne, Ind. OF Jake Little Memphis So. Frankllin, Tenn.
OF Mike Carter Rutgers Fr. Bloomfield, N.J.
OF Vinny Zarrillo Rutgers Jr. Forked River, N.J.
DH Luke Borders USF Fr. Winter Haven, Fla.